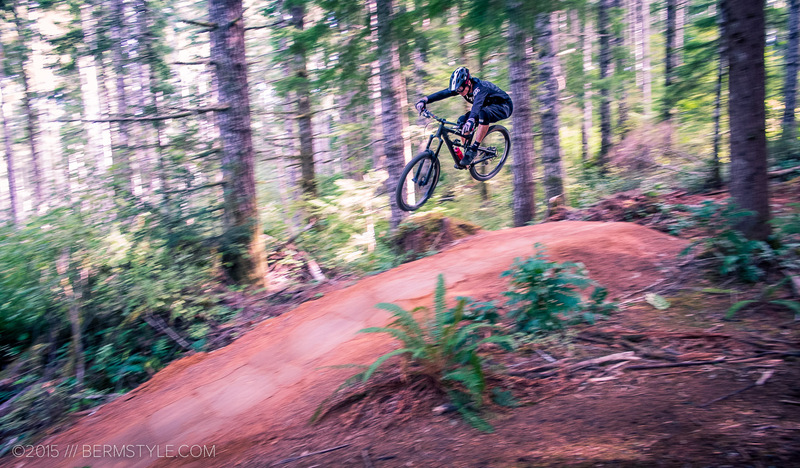 Flow trails are huge here in Oregon, with riders turning out in hordes every weekend to experience the roller coaster like rush of flying through trees, negotiating flowy bermed turns, pumping rollers and taking to the air on table top jumps hidden in BLM forests. 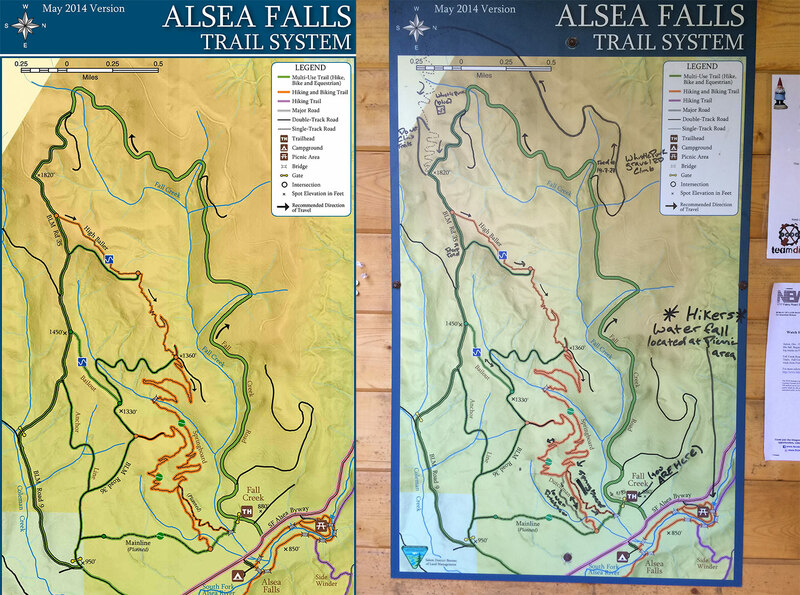 The newest gem in the BLM’s crown is the trail system at Alsea Falls. Add Alsea Falls to your Oregon road trip to-do list. With 6-8 or so miles of trails, at the moment the overall milage is somewhat low, but the fun factor is through the roof. 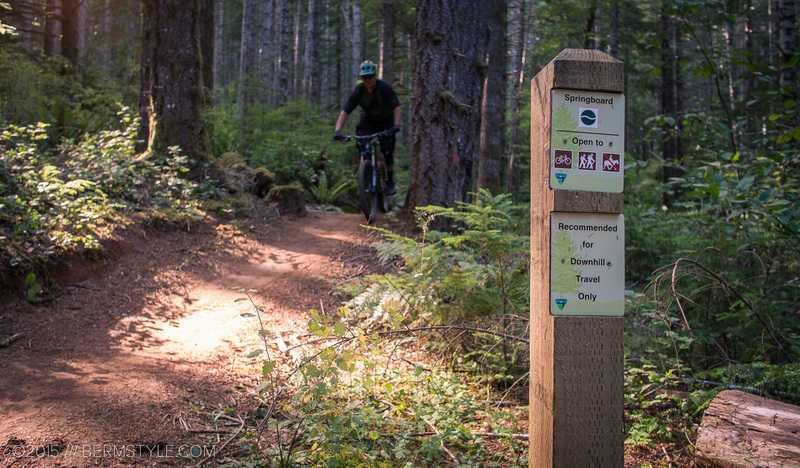 Oregon has a considerable amount of long distance backcountry style rides, but at Alsea, the focus of the trail building has been the riding experience. 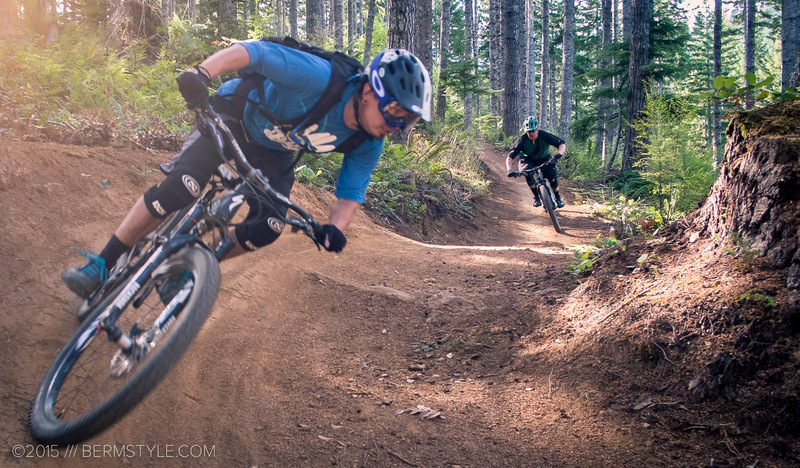 While segments of trail are short, they’re designed to be sessioned bike park style. It certainly doesn’t hurt that it’s located in the heart of a beautiful Oregon forest. 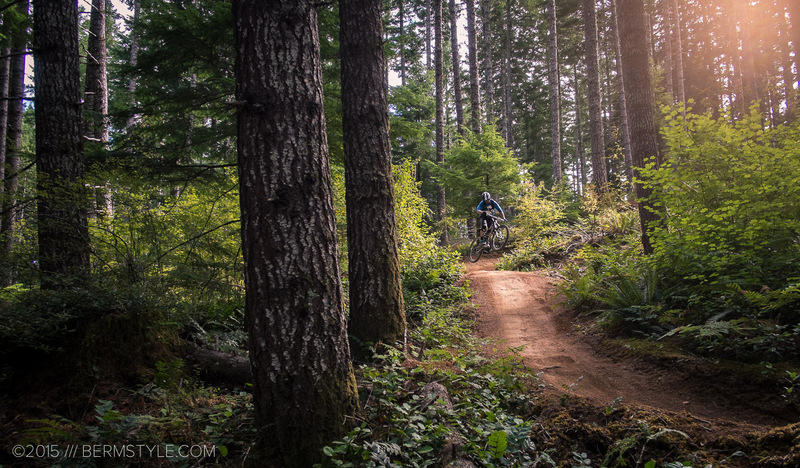 Much of the flow is reminiscent of the trails at Sandy Ridge, a popular trail destination east of Portland. 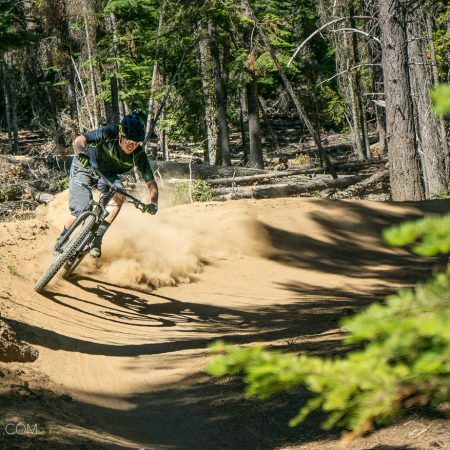 This doesn’t come as a surprise, as they’re both BLM projects that utilized IMBA Trail Solutions Specialists involved in the Sandy Ridge System. 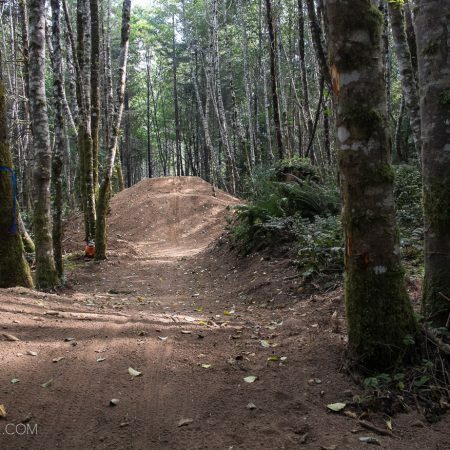 Much of the credit for the local trail building goes to local club Team Dirt, who have logged around *2000 <update: according to Eric Emerson of Team Dirt, the crew has put in over 7500 hours to date> hours of volunteer labor. From the kiosk up Fall Creek Road. When the trail system initially opened earlier this year, it consisted of 6 miles of rolling single track. Since then, construction has continued, with several miles of trail already running. It will eventually contain upwards of 20 miles of trail, assuming volunteers continue to turn out, and the popularity of the trail builds. Dropping into Whistle Punk trail. Our route was considerably different from the “full loop” described on MTBProject, and more inline with the Whistle Punk to Springboard Loop. Following the map at the kiosk, we began by climbing up the paved Fall Creek road. (see yellow gate in image above) When we reached a gravel road marked 17-7-27 as seen on the kiosk map, we headed right and followed it up to the top of the Whistle Punk trail. Whistle Punk is fast and fun with some technical rock features, like this rock armored section over roots. Note: at the moment, there is some logging going on, but as crews were done for the day, they let us hike through, though we had a bit of a hike a bike over downed trees that had yet to be fully harvested. Other than our episode of hiking, the climb went by relatively quickly and is comparable to the road climb at Sandy Ridge. After reaching the top, it was time to drop in, and peering into the trees at the trail, it was clear we were in for a treat. 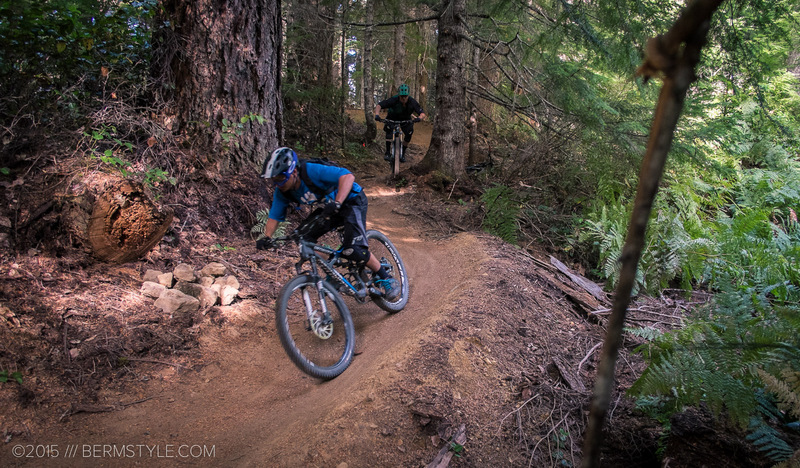 Izaak and Joe train through a sweeping berm on Whistle Punk trail at Alsea Falls. The newer Whistle Punk trail was considerably more raw than the typical groomed flow trail, with the route undulating over rocks and roots. 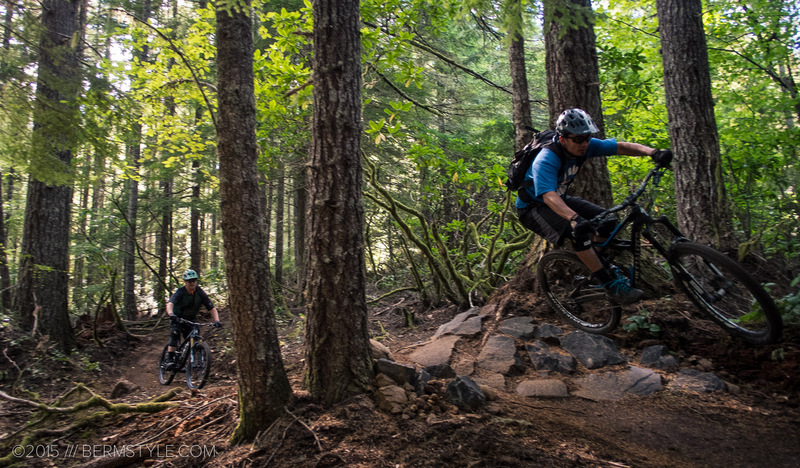 Rocks and choppy sections take advantage of the capacity found in modern suspension bikes and momentum is required to flow the section at speed. 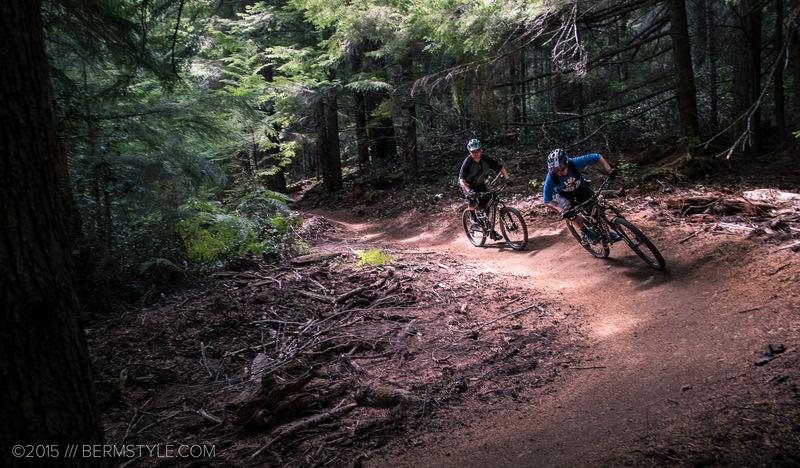 Riders that prefer more technical trail will want to make it a point to ride this section, as it was good fun, with rock gardens and plenty of dips presenting optional sections to double roughly hewn rollers. We banged through as smoothly as we could, having never seen it before, all the time with large grins affixed to our faces. 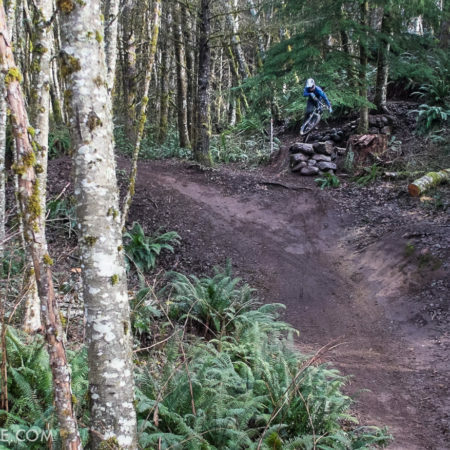 Berms and roots: Whistle Punk has a great mix of classic Oregon terrain mixed with flow trail style features. It gets dark under the canopy of the trees, making photos a bit challenging with a compact camera, but I managed to get the crew to stop a few times in order to capture moments that went by much too quickly. The turn at the exit of Whistle Blower where it meets BLM road 35. After dropping out onto BLM Road 35, you roll it briefly before dropping into the next trail: High Baller. 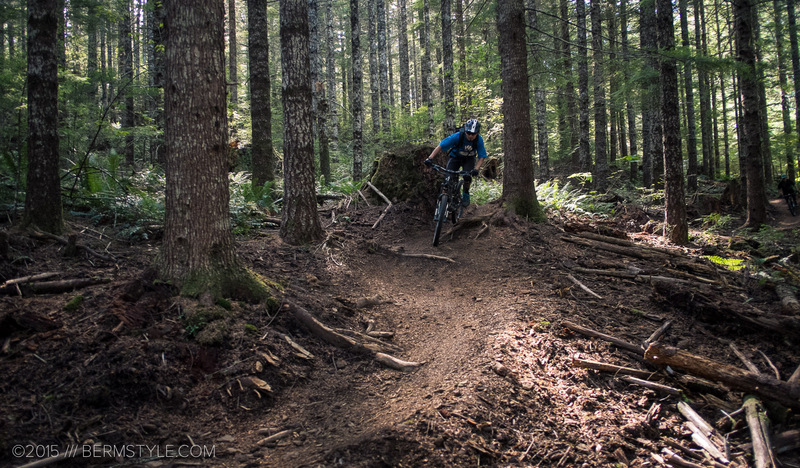 High Baller starts out somewhat similar to Whistle Punk before opening up to be a higher speed Oregon-style flow trail, filled with never ending opportunities for hang time. It’s a ridiculous amount of fun that deserves to be repeated. Then repeated again. A table top on High Baller. The trails were in amazing condition, with the just the right amount of moisture, though with high clay content, you’ll want to be careful on wet days to avoid slapping the ground. For us things were just right. 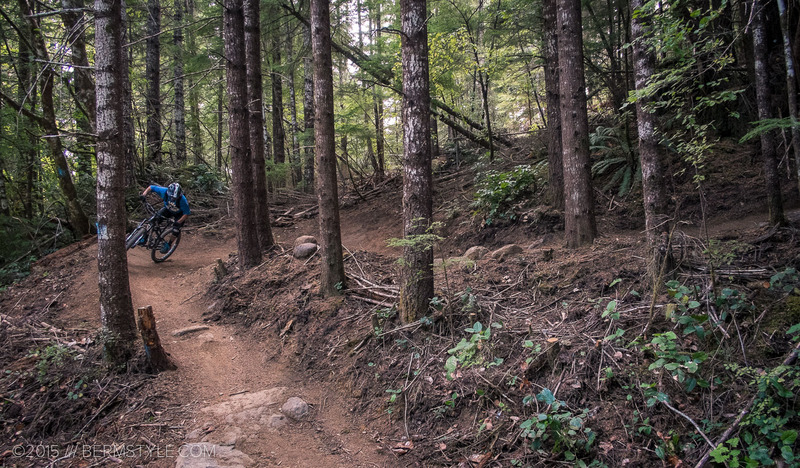 There was recently a Shuttle Day FUNdraiser at Alsea Falls, and we’ll be making a point of attending them in the future in order to get plenty of session time. Handing the camera to bro to get a photo for Instagram on the last table top before the trail turns into Springboard Trail. At the end of High Baller the trail connects to Springboard the final section of good times. Unfortunately we didn’t have the time for another go, so after hanging out at the lot for a minute we went our separate ways. The only downside for us was getting to the trail. Corvallis and Eugene residents have it good, but it’s a 2 hour+ drive from Portland. It’s also worth noting that while your smart phone’s directions will get you most of the way there, about 15 miles from the parking lot, cell service becomes spotty, so we recommend writing down the directions as well. 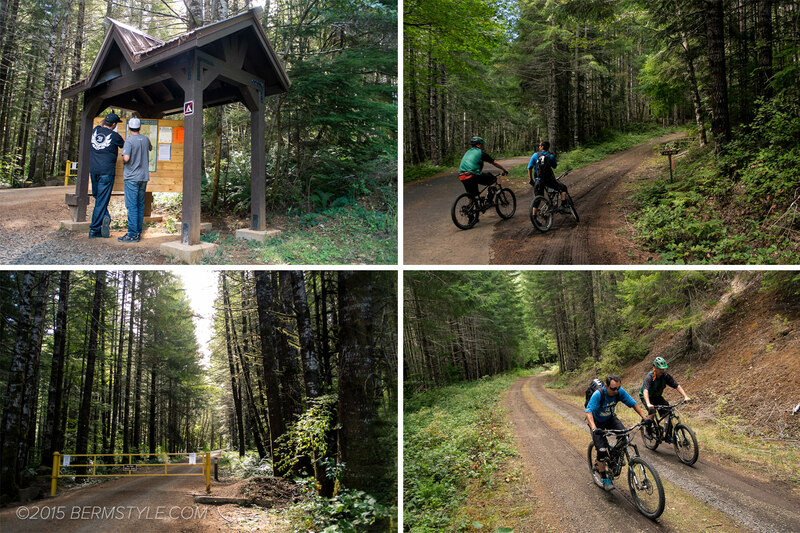 Following Alpine from Highway 99 is a safe bet that keeps you on paved roads, and the route is well signed: simply follow the signs to Alsea Falls. We drove to the campgrounds initially and were a bit confused, and we were only a turn or two away from our destination and the trail head. 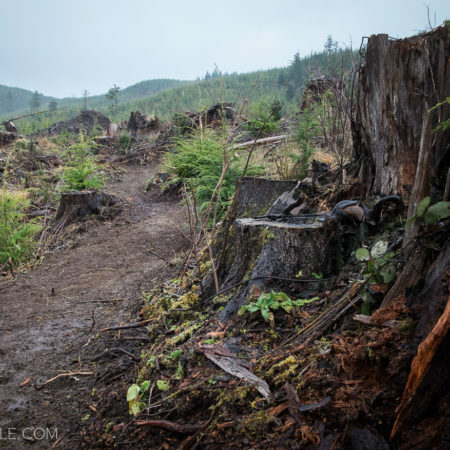 It doesn’t look like the work will be stopping anytime soon; Team Dirt now has their own excavator and a fat arsenal of trail building equipment and it doesn’t sound like they plan to stop until Alsea makes it to #1 on your Oregon Road Trip Destination list. 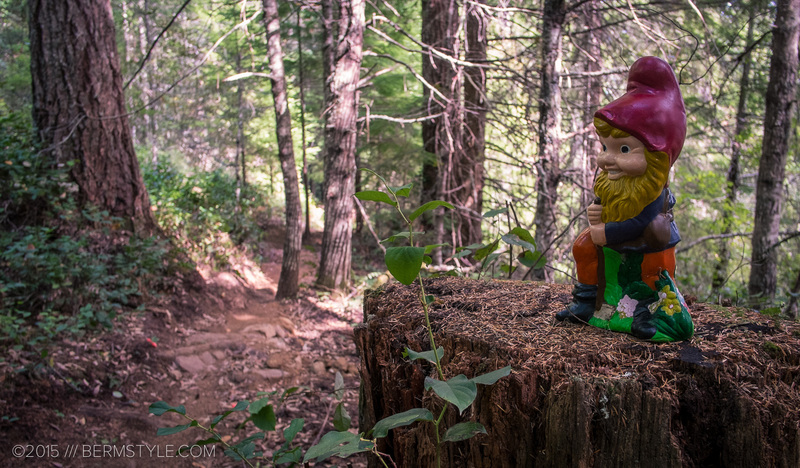 Team Dirt Trail Gnomes can be found throughout the trail network. Bikes: We were all riding on 6″ travel enduro capable rigs, but next time I’ll hopefully have a short travel trail ripper to take advantage of all the play time. You’ll have fun regardless of what you bring. Riders: Joe Mosquera, Izaak Van Horn and Jason Van Horn. Photos shot using a Fuji X-E1 with an Fujinon XF 18mm F2 R Lens , which happens to fit neatly into the main compartment of my lumbar pack.